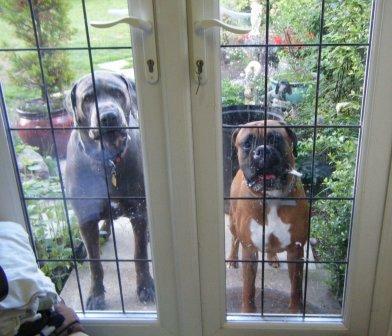 Great Dane Blue and Boxer Sebastian lived happily together with their owners. Both dogs have their own traits – Blue is a bit needy probably due to health issues when he was a puppy, and Sebastian is very exuberant. Then, about a year ago, they added Harry, a St.Bernard, to the mix. 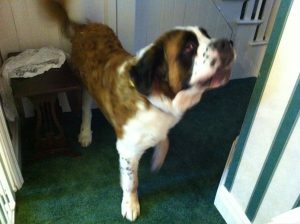 Things seemed to go very well until about four weeks ago when the St.Bernard and the Boxer had their first big fight. Since then, as soon as they have come into each other’s presence there has been a big fight and damage, especially to Sebastian. The situation seemed to come out of the blue, but in hindsight the unchecked play between the two dogs was becoming extreme and should have been a warning sign. Hindsight is a wonderful thing. I personally nip in the bud boisterous play between my own dogs the minute it looks like getting out of hand with any body-slamming or ‘hunting down’. The problem now with Harry and Sebastian is that their entry level is hackles, snarling and FIGHT. The ingredients seem to a mix of Blue, who keeps out of the way, but generally hypes up the atmosphere with excessive barking and anxiety especially if the lady of the house is out of sight, and Sebastian who tends to be over-excitable. 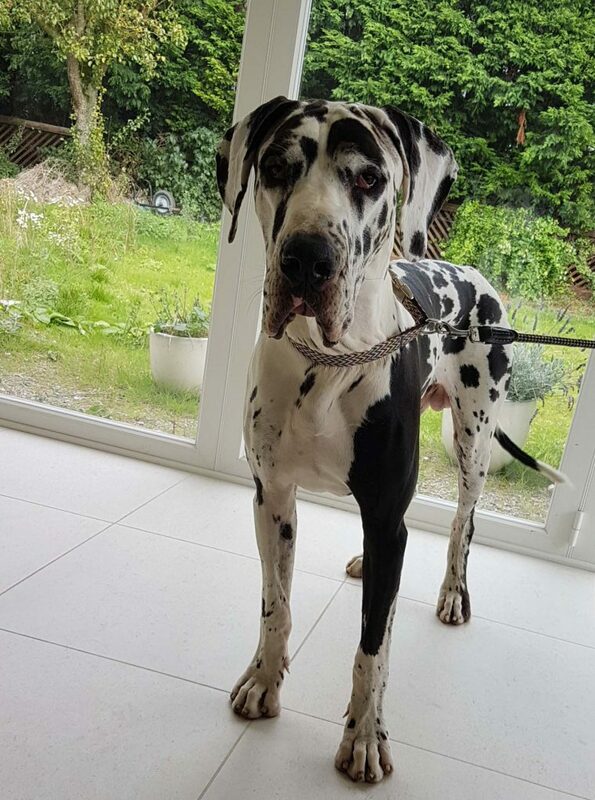 One-year-old Great Dane Harry is a calmer dog, but is now an adolescent challenging Sebastian, and there is a lot of testosterone flying about. 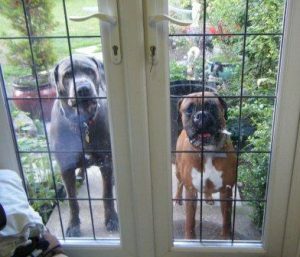 In order to keep the two dogs separate means constantly moving dogs about the house like chess pieces, two in the garden while the third comes downstairs, one in the utility room while two are fed elsewhere, two upstairs while the third is let out into the garden – and so on. Very difficult. The people are incredibly patient and doing everything they can possibly find to remedy the situation between their beloved dogs, but are naturally extremely worried and wonder whether it will ever end. Not having witnessed the fighting, I have to guess what triggers it. I suspect a cocktail of doggy personalities, over-excitement, stress and teenage testosterone. Most have kicked off in doorways. We are working on the humans creating as calm an atmosphere as possible. Meanwhile, so that the humans will be able to relax when the rehabilitation process begins, both dogs will be introduced to muzzles in such a way that over the next two or three weeks they will learn to welcome them and happily be able to spend some time muzzled. Sebastian will probably get his off and eat it! However, Harry is the main aggressor and does the most damage. Now, with a calmer environment, some rules in place and muzzles accepted, they need to work at re-introducing the dogs bit by bit, initially just walking one past the other a few times on lead at home, interrupting any eye-balling, along with parallel walking techniques out in the open. I sincerely hope that this works and that the two dogs, like some humans, do not now hate each other to the extent they simply can’t live together. Splitting up a St.Bernard fighting a large Boxer is no joke. NB. For the sake of the story and for confidentiality also, this isn’t a complete ‘report’ with every detail, but I choose an angle with maybe a bit of poetic licence. The precise protocols to best use for your own dog may be different to the approaches I have worked out for Blue and Sebastian. Finding instructions on the internet or TV that are not tailored to your own dog can do more harm than good as the case needs to be assessed correctly. One size does not fit all so accurate assessment is important, particularly where aggression of any kind is involved. Everything depends upon context. If you live in my own area I would be very pleased to help with strategies tailored to your own dog (see my Help page). Nothing is more important on a walk than for a dog than to feel safe. A few months ago the young Staffie Boxer mix was attacked by another dog. She was sitting beside the gentleman minding her own business, and off-lead dogs ran up to them. It ended in a fight, followed by angry shouting from the owner of the off lead dogs – which is so often the case! 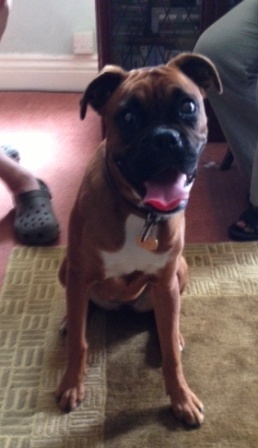 Shortly afterwards, Roxy was attacked by another dog and she was ready this time – she fought back. People with uncontrolled, off-lead dogs have so much to answer for. What can conscientious dog owners do to protect their dogs? They have to avoid certain places and times, which is unfair. The couple have only had Roxy for nine months. She had been picked up as a stray. To start with she mixed well with dogs and there were no problems on walks apart from the pulling on lead. Roxy no longer feels safe, though it may not be as bad as her owners think because they now keep their distance. Although she has several doggie friends that she plays with, they very understandably feel wary themselves now. As soon as they see a dog, even if Roxy isn’t reacting at all, the lead tightens on the Halti as they make their escape. What message is this giving her? That all dogs she doesn’t know are potential trouble. Along with her humans, Roxy needs to learn that just because two dogs have been bad news, both with a reputation locally, most dogs are fine. 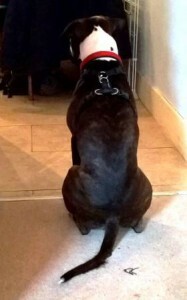 They had been advised to food reward Roxy when she’s stopped barking. Fair enough, but I prefer to feed before she gets to the barking stage, when she is aware of the other dog but at a ‘safe’ distance. This then eases the emotion of anxiety and associates other dogs with good stuff. If food-motivated Roxy won’t take chicken, then they are too close. She is ‘over threshold’. Whilst avoiding other dogs altogether gets them nowhere, pushing her too close too soon will only make things worse. 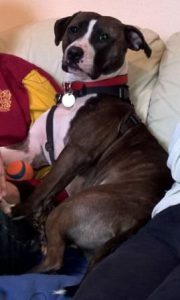 By ‘reading’ Roxy’s signals and reacting in response to how she is feeling and not preempting, they may even now possibly pass near many dogs with no reaction at all. The tricky thing is that Roxy may react differently at different times. One day she could get quite near to a dog before reacting and the next day she may bark when she sees the same dog at a distance. The main variable will be the level of her accumulated stress levels at the time and all sorts of things can contribute to this. So – the groundwork is to reduce stress in all areas of Roxy’s life, to make sure the equipment they use causes her no discomfort and the lead should be loose – change the Halti for a comfortable harness with two contact points. This can take time. The end aim is for Roxy to clock in with her human when she sees another dog and then trust him/her to make the best decision. Even if sometimes ‘life happens’ and things go wrong, both dog and humans should have sufficient bounce-back to dust themselves off so to speak and carry on. Being attacked by another dog can have a devastating effect, but even in times of war a good leader keeps going, is trusted and keeps calm. Respect is something that needs to be earned. Respectful dogs have good manners – but it also goes both ways. We need to treat them with respect also. Tyson, 5, and Kyai (on the left) who is 13 months old, have potential to be such wonderful dogs if given proper ‘dog parenting’, but from when I arrived they were leaping on me, flying all over the sofa and over their owners, the younger Kyai in particular. Both dogs stand on the lady or stand over her. Tyson paraded and flaunted chews and toys practically all the time – ‘Look what I’ve got – you can’t have it!’, turning his head away if they tried to take it, and to goad Kyai – which sometimes ends in a spat. Tyson has shown aggression with the man when he tries to force an item off him or physically tries to move him. Kyai will growl and air snap if touched when lying on the sofa between them. Kyai has also chewed most of the door frames in the house and the sofas are ruined. He may toilet at night or when left. All this because there are few rules and boundaries; they really are lovely natured dogs, and much-loved. The young man plays hands-on rough stuff but gets angry also. Kyai is a bit fearful of him sometimes. The lady is a pushover and encourages the impolite behaviour towards her. The dogs are worst in the evening, just when the humans want to relax after a days’ work. There are a lot of things that need tweaking. The dogs simply aren’t being taught what they should do – both know plenty of commands but that has little to do with it. The daily routine isn’t helpful. The dogs are walked separately first thing in the morning before work – probably not enough to tire them out. Then they are alone during the day with a visit at lunch time – and their only meal is in the evening which concentrates all the energy into the wrong part of the day. It seems that at the time when the dogs will have the most energy, no constructive stimulation, brain-work or exercise is provided. Cuddling doesn’t count – nor do rough games. I really hope that they will follow my suggestions consistently and drink from the same water bowl, so to speak. Often changing their ways can be harder for one person than the other. They can change the daily routine and show their dogs that the best attention is given to them when they are polite, rather than when jumping, chewing people’s feet and so on. These dogs will be a lot better mannered and more biddable if their humans back-off a little and encourage them to work for attention and food. 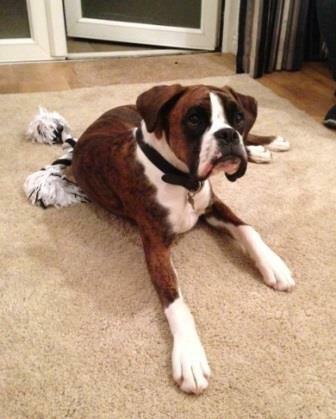 Some consistent boundaries will help Tyson to become less agitated and both to calm down. Anything in too much abundance loses value, whether it’s food or fuss. NB. 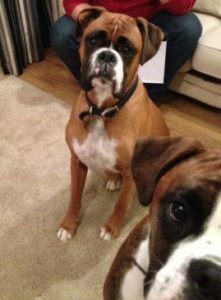 The precise protocols to best use for your own dog may be different to the approach I have worked out for Tyson and Kyai, which is why I don’t go into all exact details here of our plan. Finding instructions on the internet or TV that are not tailored to your own dog can do more harm than good. One size does not fit all. 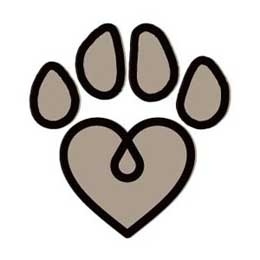 If you live in my own area I would be very pleased to help with strategies specific to your own dogs (see my Get Help page). 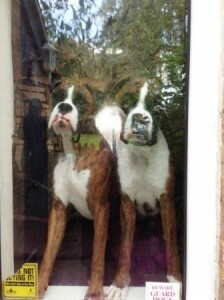 There they are, on the left, up on the sofa at the window watching me leave – Bronson and Rambo. Their young owners have been working hard to train them, but it’s not always easy. Their dream of happy walks with two lovely, friendly dogs and of polite behaviour with guests to their house just is not working out. It’s a mix of problems really. Nothing extreme. Rambo is a lot more confident than Bronson and likes to put him in his place – with Bronson only being pushed so far. They may then have a bust up but in no time at all they are the best of friends again. This can be the challenge of siblings. Bronson is the nervous one, and this has now escalated into his being scared of approaching people when on walks and reacting to other dogs. They can’t work out how or why it started. One day he simply went for a smaller dog and it has gone downhill since. Bronson and Rambo’s walks should be more under the control of their humans. A hyped-up dog, straining on a tight lead with the discomfort of a Halti around his face, is going to be stressed. Meetings and greetings, too, should be under the control of the humans. When they have proved to Bronson by their own behaviour that he can trust them (and it will take time and effort which I know they are more than willing to give), Bronson should relax. When friends come to the house the couple has worked hard to train the dogs to stay away on their ‘place’ away from the front door. However, once released they are no less excitable – jumping all over people and maybe mouthing or nipping. I feel this needs a ‘behavioural’ approach – dealing with the emotion that causes the behaviour – rather than ‘training’. 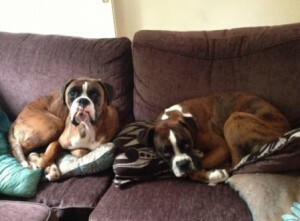 Why do the dogs behave like this? Is it simply because they are so friendly? I think not. If a human were to greet a guest in such an overwhelming manner, it could be down to anxiety. The dogs need to be removed from the situation until everything has calmed down. Welcoming people is another thing that needs to be under the control of the humans, and the guests need a firm lesson or two on how to behave when the dogs do join them! When I arrived there was little jumping on me and no nipping. The dogs were relieved of pressure and responsibility. I turned away from the jumping up and asked the owners not to intervene; I pointed out the lady’s tense and worried body language and she visibly relaxed. There were only calm and confident vibes for the dogs to pick up on. They are superb dogs, living with a young couple who want to learn how to do the best they can for them; who have always only considered positive methods. They simply need more strategies – more options, the sort of tricks and solutions I have picked up along the way by helping so many dogs. 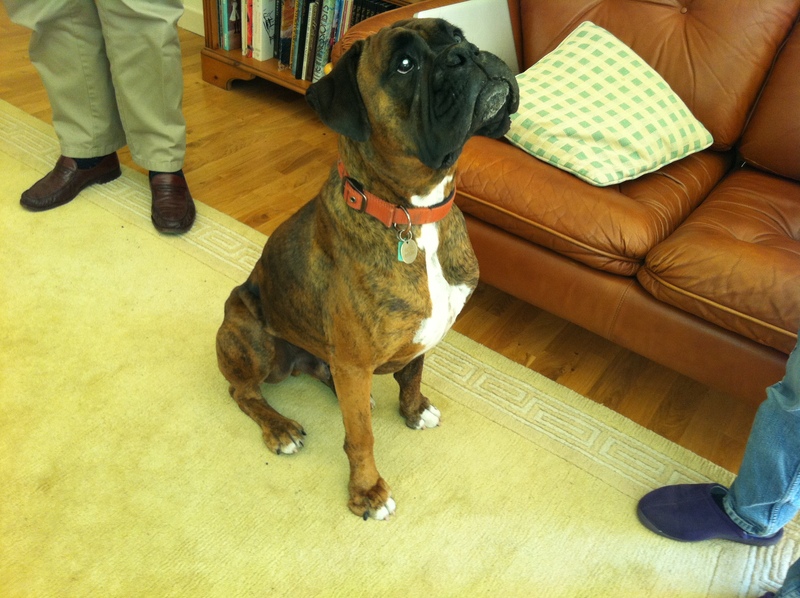 Three-year-old Ollie is large for a Boxer and he’s wonderfull! He’s not only absolutely confident and fearless, but also gentle and friendly without being pushy. In the house he’s biddable and obedient. He has been extremely well socialised from the start, sensibly trained, and was castrated at about eighteen months. However gradually, over time, his attitude towards other dogs has deteriorated. 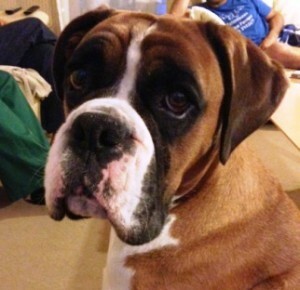 Ollie now bullies other dogs – those he doesn’t know. He seems to want to control every dog he meets. He will put his head over them, stand over them and if the dog submits he’ll pin it down. If the other dog doesn’t like it, there’s trouble! Walks are now taken early morning to avoid other dogs, along exactly the same route each day, mostly off lead. He goes daily to the family farm where he has freedom to do as he wishes and go where he likes. When he’s called he comes back (maybe finishes first what he was doing! )………unless he sees another dog. Could rough play from humans be contributing to the problem? Ollie has control of most things in life. He also has excellent self-control. He’s not a demanding dog, but what he wants in the way of attention and play he usually gets. Add to this a mix of frustration and over-excitement building up in him due to the sort of play he gets, and it could be what triggers his intolerance. The young man and his friends play rough and tumble with Ollie, which ends up with him being so hyped up that he starts to hump them. To stop him they lift him up (he must be very heavy) and though they don’t mean to tease him, this is what is happening. Daily on his way to the farm he is fired up with barking at dogs from the back of the truck. On arrival, the young man kicks a basketball for him as they walk through the fields. This ball is too big for him to pick up and destroy, so he becomes frustrated. I remember years ago having a similar ball for my Rottweiller and not being able to ‘catch it’ would make him frustrated and angry. He would then redirect his frustration onto the other dog I had at the time. Needless to say I removed the ball. It is proven that stress continues to build up in dogs over time. It may not show from outside. We don’t approach this problem with Ollie and other dogs head on – the fact he bullies other dogs in itself it’s not the problem, more a symptom. Getting a little more control over all general decision-making, putting a few more demands on Ollie in terms of working for them for rewards along with cutting down on excitement and frustration should make a huge difference. Added to this, his humans need to react appropriately when they see another dog. Avoiding dogs altogether will get them nowhere. They also need to be working very hard on Ollie’s recall, making themselves relevant and more rewarding than anything else so that obeying a call or whistle becomes automatic over time. 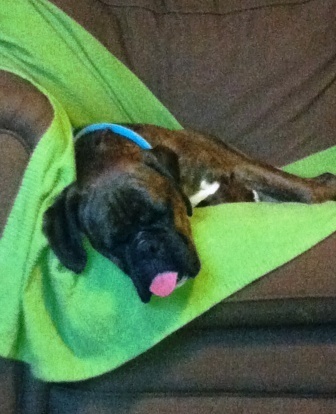 This is Candy, a 2-year-old Boxer in her typical pose with tongue out! Up until last October her sister, Floss, lived with them also, but due to Floss’ bullying and dominating Candy who was the more sensitive and nervous of the two, they found a new home for Floss. This was additionally necessary because it had developed into fighting and drawing blood, and the family has two young children. It is likely we could have done something about this had I been called in back then. Straight away Candy was a happier, more relaxed dog – in all respects bar one. Where before she had been fine around other dogs, now she is extremely reactive – barking and lunging in a scary manner. It seems she felt that the bossy Floss was the leader, protector and decision-maker out on walks and without her the burden has fallen upon Candy herself. She simply can’t cope. At home she is mild-mannered, gentle and loving. Then as soon as the door is open she charges out, pulling. This will be very uncomfortable for her because she still pulls despite wearing a Gentle Leader head halter which she hates and tries to remove. It is a really clear example of how dogs, especially dogs of a more nervous temperament, need leadership in the sense of ‘guide, decision-maker and protector’ (not ‘dictator’) and it would seem in Candy’s case that even Floss’ sort of leadership was better than none. The lady has taken her to classes. On walks they continually correct her by jerking the lead and saying ‘heel’. It makes no difference beyond probably adding to the stress of all concerned. All they are doing is trying to control her physically because they are stronger than she is and have the head halter. This is not what I consider to be leadership and neither, evidently, does Candy. It would be a rare sight to see a dog that walks calmly beside a person on a longish loose lead, sniffing the ground and doing what dogs naturally do, with no gadgets like head halters or retractable leads, suddenly lunging and barking at other dogs. Happy, calm, loose-lead walking is where it all has to start, and I show how this is achieved. Then ‘other dogs’ can be added gradually into the equation, but in controlled situations to begin with. 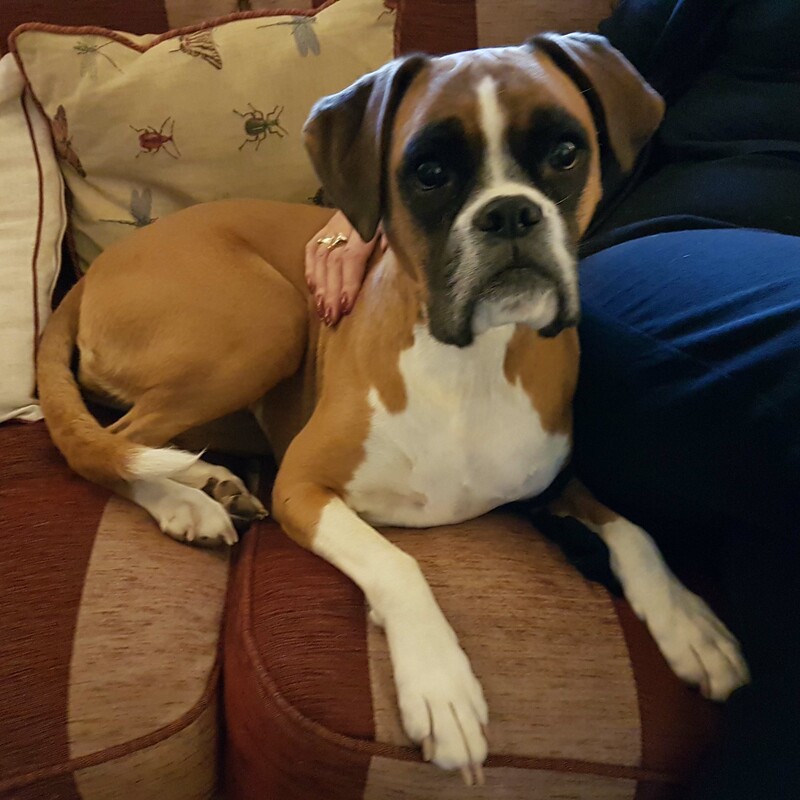 Alfie is a three and a half year old Boxer. He has lived with his new people for eight weeks now and has landed on his four white feet. His new owners have also struck lucky with Alfie! His good points far outweight the difficulties. He is biddable, friendly and not overly excitable. The problems they are having with Alfie are, like so many, out on walks. Alfie barks at people in a worrying manner. As they live in a village it’s impossible for them to stop and talk to anyone. He ‘squares up’ to other dogs they meet, though hasn’t shown aggression as such. A couple of incidents when he was off lead took them by surprise so they are now wary. Anticipating problems transfers down the lead to the dog and merely reinforces his fears that other dogs and people could mean trouble. Correcting or using force when he does react doubly reinforces his fears by associating discomfort and stress with other dogs. What is the alternative, you may ask? We look at it through the eyes of the dog! Dog training classes can be too stressful for many reactive dogs because they are thrown into the deep end where proximity to other dogs is concerned. It can be noisy and there may be other reactive and scared dogs. I have been there and I have done it. The whole thing needs to be taken back to basics and done differently. People worry about ‘socialising’. If a dog isn’t adequately socialised with well-balanced dogs in the early weeks when he is naturally friendly and playful, it is much more difficult. Plunging a dog into threatening situations to ‘force him out of it’ is, at best, unkind. The dog needs to be gently stretched in a controlled fashion in order to improve, and learn to trust you to understand him and to be on his side. You may never end up with a ‘sociable’ dog that wants to go and play with other dogs, but a dog that ignores them and is happy to be with you instead. Most dogs who are a problem on walks are over-excited before they leave the house. Not so Alfie. He is calm as they leave the house and can walk nicely when there are no distractions. He is halfway there already.